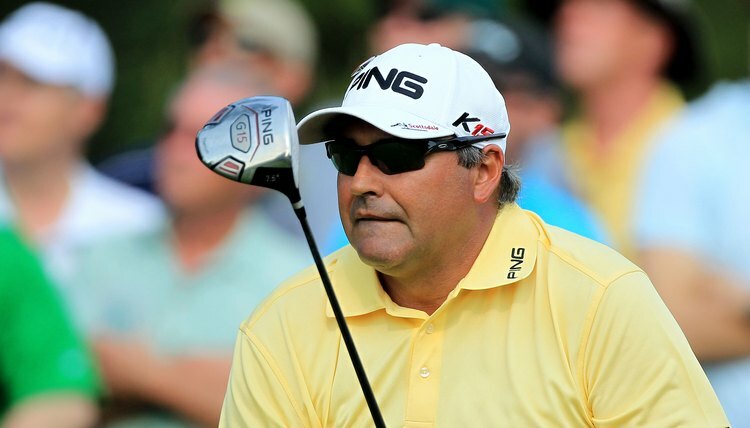 Angel Cabrera uses a PING driver during the 2011 Masters Tournament. PING is one of the world’s leading golf club manufacturers. The company sells different lines of irons, woods, hybrids and putters, with designs aimed at casual golfers as well as PGA Tour players. Having a professional club fitter help with your selection is always a good idea. But if that’s not possible, take a close look at your game and choose the PING clubs that best suit your technique and style of play. Examine the specifications for different lines of PING clubs. PING’s website lists each line of clubs it sells and offers charts that display each line’s key characteristics. Casual or high-handicap golfers, for example, should focus on the “Forgiveness” line of each chart. Clubs with “extreme” or “maximum” forgiveness have larger club heads, greater offset and will be more forgiving of mis-hit shots. Low-handicap players may be better off with clubs featuring “maximum workability” and smaller club heads, which allow for better touch and feel. Consider each line’s specifications. If you’ve narrowed your choices to two lines of woods, for example, PING’s website allows you to dig deeper by clicking on the name of each line to reveal greater details, such as the specific length and loft of each club. If you have difficulty getting the ball in the air, for example, choose the clubs with greater loft. “In the majority of cases, the higher the degree of loft, the better,” says golf writer Harry Hurt. Choose the correct shaft. PING allows purchasers to customize each club, and the choice of shaft is a key option. When selecting a shaft, golf writer Steve Newell notes, “flex is the first consideration.” In general, players with greater swing speeds need stiffer shafts, while those with slower swings should select more flexible shafts, according to Hurt. Graphite is the typical material of choice for drivers because it’s lighter than steel, permitting more of the club’s weight to be focused in the head, explains Newell. Steel remains the popular choice for irons, but golfers with low swing speeds should also consider graphite. Consider hybrid clubs if you have difficulty hitting long irons. After consulting the chart listing PING’s hybrid lines, click on the name of your chosen line. The line’s specifications will tell you which iron and/or fairway wood each hybrid is designed to replace. Try out some putters. Newell notes that putter selection “is open to greater personal interpretation than any other club.” Find a retailer that sells a variety of PING putters and try them out on the retailer’s practice green. What Are Clone Golf Clubs? What Is a Forged Iron? What Are the Names of the Parts of a Golf Club? What Wedges Are Banned From the PGA? What Is in a Complete Set Golf Bag?